Competition, beyond the glory of the best, has a blissful effect on a broader community. It encourages engineers to challenge the known boundaries of possibilities and artists to create designs never seen before. While bringing haute horlogerie closer to people, contests grow a new circle of individuals hopelessly attracted to fine timepieces. Fuelled more by the satisfaction of human desires and investment intentions than that of necessity, the market for fine watches is very similar to the market of the arts. The jury is composed of representatives of the fine-watchmaking industry and aficionados: watchmakers, journalists, editors, collectors and the president of the jury is Aurel Bacs, international director of the watch department at Christie’s Switzerland. Fulfilling its mission, the Foundation travels all the 71 pre-selected supreme timepieces nominated to the award to a few cities, before the winner of each category is announced on 15th November at the Grand Théâtre de Genève. The exhibitions have taken place in Beijing, Macau, Singapore, Dubai and Geneva. 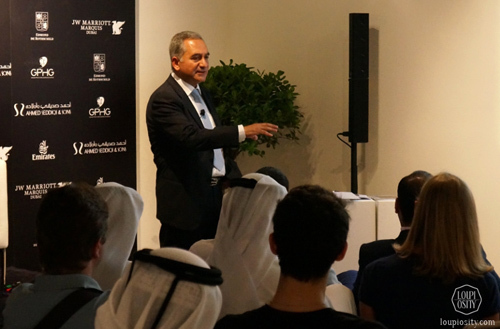 In the Emirates, the event venue was the Cuadro Fine Art Gallery, neighbouring the Christie’s Dubai Salesroom. The region’s most prominent Swiss watch distributor, Ahmed Seddiqi & Sons played a key part in the organization of the event. 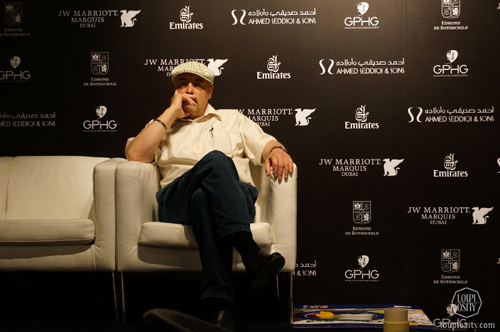 The company maintains excellent relations with the Foundation of Geneva Watchmaking Grand Prix, and Abdul Hamied Seddiqi, (vice- chairman of Ahmed Seddiqi & Sons) was also a member of the jury in 2011. In addition to displaying the competing pieces in all 10 categories, workshops were held for the enthusiasts. Watch auctions have become very frequent, and collectors look for limited editions, prototypes, and one-off pieces – as Mr. Claude Sfeir, the region‘s renowned collector, gemmologist and member of the Jury shared with the audience, sometimes you wait decades to get the chance of buying the piece you’re after. Mr. Ludwig Oechslin, curator at The Musée International de l’Horlogerie, this year’s Jury Commissioner and master watchmaker, gave an interactive presentation about complications. Beyond these objects of engineering, he referred to matriculate artistic elaborations also as “visual complications”. When talking about the tourbillion, a complication with no additional functionality but having more of a regulator and today artistic role in a timepiece, Mr. Ludwig brought a very interesting point to the discussion: with the tourbillon the watch should be more precise (especially pocket watches), but adding more parts to a timepiece will have an impact on its’ vulnerability as well as accuracy. Thus it is extremely difficult to build one, which rather increases precision than reduces it. The timepieces were displayed by category. The gallery housing Aidan Salakhova’s works (“Out of body”) lent an unusual setting to the exhibition. The art of time and Ms. Salakhova’s contrasting white marble and polished granite sculptures created a clear harmony together. Audemars Piguet introduced the 10-piece limited edition Tradition Tourbillon Minute Repeater Chronograph at the SIHH 2013 that includes an AP 2874 calibre consisting of 504 parts with three major horological functions, a chronograph, tourbillon regulator, and minute repeater. This calibre is only used in the Tradition and the Jules Audemars Tourbillon Minute Repeater models. The minute repeater requires a complex mechanism; it needs to produce three different sounds, to distinguish hours, quarter hours, and minutes in the striking sequence. This watch uses two gongs, made from the two ends of a single length of wire supported in the middle, and if a third sound is needed it is made by striking the two gongs rapidly in sequence, first the high tone and then the low. In the repeater watches, the sound exuded by the watch mechanism greatly depends on the material, size and proportion of the case. According to the manufacture, the gong produces the most beautiful sound in the 47mm titanium version (pictured). 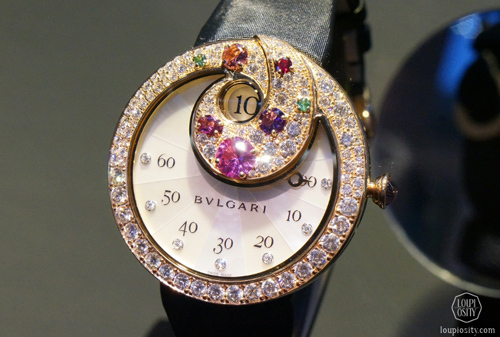 At first glance the Bulgari Berries Jumping Hours Retrograde Minutes is a jewellery watch; it features a black satin strap, and a white mother-of-pearl dial, a pink gold case set with 133 diamonds, 2 emeralds, 2 tourmalines, sapphires, rubies and amethyst and the crown is set with a tourmaline making it true to Bulgari’s Haute Joaillerie traditions. However in this Berries model the art of high jewellery has been blended with the expertise of mechanical horology. The case hides an in-house made self-winding mechanical movement with power reserve, jumping hours, and retrograde minutes. The retrograde minutes hand makes an instant 180° counter-clockwise jump every hour. 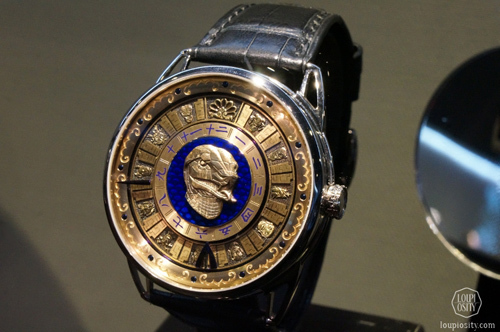 The back of the watch is a sapphire glass, through which the 22k gold oscillating weight is clearly visible. 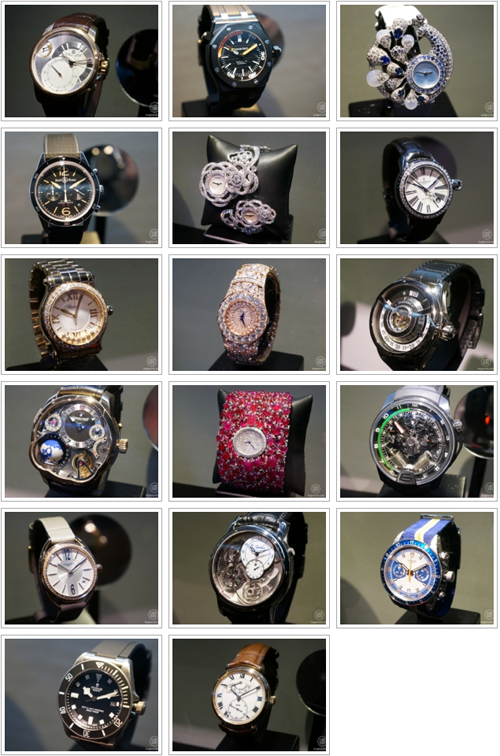 Almost all the watches made their debut at the SIHH or Baselworld, entries in the Grand Prix d’Horlogerie de Genève category were accepted until 15 June in 10 categories. The jury selected 71 runners-up from all the entered pieces, and one watch in each category will be announced the winner on 15 November. Let me highlight a few pieces that made a particularly profound impression on me and that I have not discussed previously. Photo credits: Loupiosity.com. The Facebook albums above contain images of GPHG. All registered trademarks are property of their respective owners. All rights reserved.